Clear vinyl panels for easy viewing while keeping out the elements.Price is Per 10' Sidewall.Sidewalls attach to each other with zippers. does it have a top for the tent, right ?, Do you have one that is higher than 7 feet tall ?. does the tent fold in while the top is on or does it have to be removed before folding and storing away ?. This particular item is only a clear side wall. 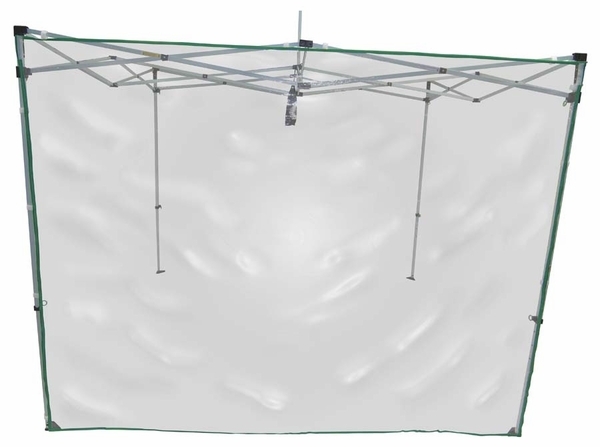 If you need a actual canopy with frame a top as well, please view our Caravan 10 x 10 Displayshade Canopy Value Package + 4 Sidewalls located here. Set up takes just seconds, too, thanks to Caravan's exclusive pull-pin technology. Simply hold one end of the frame and pull - the frame expands, stretches and aligns itself properly, with only a minimum of strength or effort needed on your part. We do not offer a canopy with a clearance height over 7' feet. How do you store the sidewall so that it does not stick together when folded? These are professional grade walls meant for the Caravan brand frames. And, these walls are polyester, and not vinyl. They should not stick together when folded. Is this 10 feet high? I need a height of 10 ft. The approximate height is 7'. Can these be used with 10' X 10' EZ Up straight leg canopies? These sidewalls are model and brand specific and will only work with Caravan brand canopies. How are the sidewalls attached to the frame? Can you send me an illustration or directions? Thank you. While no installation instructions are available, the sidewalls attach to the frame with velcro at the top and have zippers at the sides for attaching sidewalls to each other. What is the height of this sidewall?? This sidewall is made to the specifications of the Caravan 10x10 instant canopies. As such, the approximate height is 7'. This sidewall is not intended to be used or modified for any other canopies. What is the thickness (mil) of the clear sidewall material? Does it come in lengths longer than 10 ft? The thickness of this wall is 10.5 mil. You may also consider the Caravan 15' Clear Sidewall. I time track meets and have a 10' x10' tent over the table where all my equipment is sitting. When it's cold or raining wanted to protect the equipment better. I need to be able to see the starter for each race and he is 4 different postions during a meet. These allow me to see the starter and also stay warm, dry, and cozy.